Permission has been granted for fourteen bands bands and around 1,500 marchers to pass the area and play music on their way to Stormont as they mark the 100th anniversary of the signing of the Ulster Covenant. St Patricks’ Church has been the focus of repeated sectarian provocations and illegal acts by loyalist bands on two occasions this year. Trouble at a parade in August was followed by three days of rioting orchestrated by the UVF, in a display of force by the loyalist paramilitary organisation ahead of tomorrow’s march. The decision to allow loyalists to march and play flute tunes outside St Patrick’s church, although restricted to ‘hymns’, is being seen by as a victory for the Protestant marching orders and their unionist supporters. The ruling represents a U-turn on the last determination which restricted the playing of music to a single drum beat and prohibiting the inclusion of a controversial UVF-linked band. That determination was subsequently ignored by both the loyalist marchers and the PSNI police in an action described as “civil disobedience” by unionist politicians. An attempt by two members of the Carrick Hill Residents’ Group to challenge the determination for tomorrow’s parade failed this [Friday] afternoon when the High Court described it as a “futile” judicial review. Frank Dempsey, Chair of Carrick Hill Residents’ Group, said the loyalist groups had been “rewarded” [for provocation and violence]. 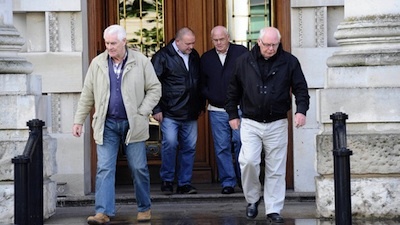 “They are rewarded and it calls into question the strategy of the Parades Commission,” he said. “This seems like an appeasement policy by the Parades Commission, trying to meet everybody half-way when the reality is right is right and wrong is wrong. “If you are rewarded for doing something wrong where does that leave the rest of us? He was speaking after a meeting between nationalist politicians, including Sinn Fein, the SDLP and residents. He said the group had, in a major concession, already withdrawn objections to the marchers passing the interface. “All we are asking for is respect for our community and respect for our church,” he said. The anti-Catholic Orange Order has still refused to speak to the Carrick Hill residents or other north Belfast residents groups ahead of the parade, despite claiming this week it had no explicit ban on talking to nationalist residents groups. There were reports it had been involved in behind-the-scenes talks with unnamed ‘parishioners’. St Patrick’s administrator Fr Michael Sheehan urged people to stay calm in the coming days. He spoke of his disappointment that details of confidential discussions had been made public. “I believe that it is neither helpful nor desirable, at this time, to publicly debate what was said or not said at the two meetings but at this stage I must make it clear that it was my hope and understanding that these conversations would ultimately lead to discussions with the residents,” he said. “It is indeed unfortunate and regrettable that this did not happen. Sinn Fein has also appealed for calm ahead of the march. North Belfast assemblyman Gerry Kelly renewed his call for the Orange Order to meet with nationalists. “The residents feel that the Parades Commission determination has rewarded the organisers and bands for their breaching en masse of their previous ruling against the bands playing music on August 25,” he said. Residents living in Carrick Hill have spoken of their fear about what could unfold tomorrow. One 49-year-old woman, who has lived in the area since 1971, said children were being sent away for the weekend. “I will be taking part in the protest because I want respect for our community,” the woman, who was too frightened to give her name, said. “We have never had respect, but we coped with it until they started insulting our chapel. They are just laughing about it.